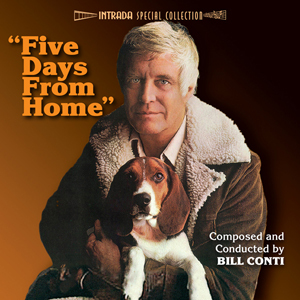 For the 1978 film Five Days from Home, star and director by George Peppard sought out composer Bill Conti because he loved the composer’s music for Rocky. Peppard wanted the inspirational sound from the hit boxing film for his picture (and the success and radio play promotion that went with it!) Conti wrote a lonely, tragic trumpet theme for the unfairly vilified Pryor, a melody that urgently echoes almost into a fugue in the main theme, while passages of anxiety accompany Pryor as he sneaks around at night. A bit of funk comes in the form of a reverberating plucked effect, keyboard, and electric guitar and action arrives, disco-dipped, showcasing Conti's diversity of style. Additionally, Conti was asked to provide three songs for the soundtrack album, with lyrics by Norman “Killing Me Softly” Gimbel, as well as disco versions of the film’s themes. Conti’s music went on to have other lives. One was unsolicited, when the 1979 Sophia Loren film Firepower used the main theme in its trailers and ads. The other came with a polite phone call from Robin Leach, who asked Conti if he could use the disco instrumental version of “Come With Me Now” for his new show, Lifestyles of the Rich and Famous. I remember seeing that movie a long, long time ago.